Discussion in 'CigaBuy' started by CigaBuy.com, Sep 28, 2017. We're having sept coupon deals at the end of Sept. And it's for a limited time only. 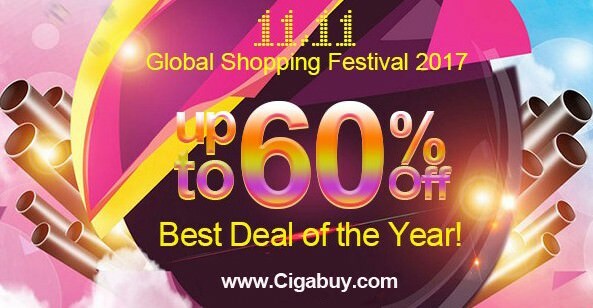 11.11 Global Shopping Festival 2017 is coming! 3rd, 72 Hours Flash Deals: up to 60% off, etc. 2017 Black Friday & Cyber Monday is Coming! 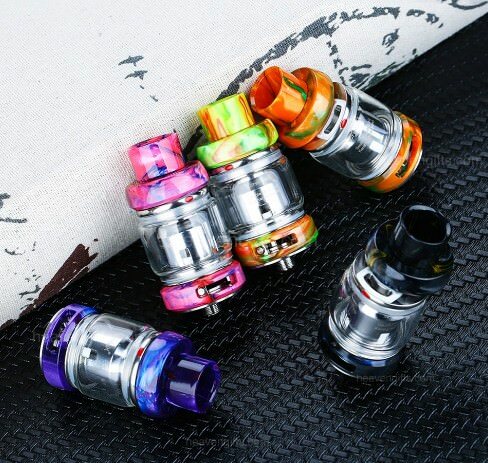 1st, if your order amount is up to $300, you can get a geekvape ammit 25 rta for free. Time is limited! 2nd, Enjoy Black Friday Coupons: Up to 40% off. 3rd, Special Items for you: Max save $10. Meanwhile, there're also collected some pretty new products & Big Discounts for you. Never Miss it! A year just once. 2017 Christmas Promotion Sale is Coming! Ends on December 26th,2017. Catch Now! 1st, Xmas Lucky Bags -- $39.99 lucky bag, $19.99 lucky bag & $9.99 lucky bag. $39.80 for IJOY CAPO Squonker 100W Kit; etc. 3rd, Xmas EU Warehouse Discount -- 3-Days Only! $16.88 -- Geekvape Peerless RDA; etc. A year just only once, Never Miss It! 2018 New Year Sale is Coming! Order Amount Over $300, get one Geekvape Zeus 4ML RTA, hurry up! 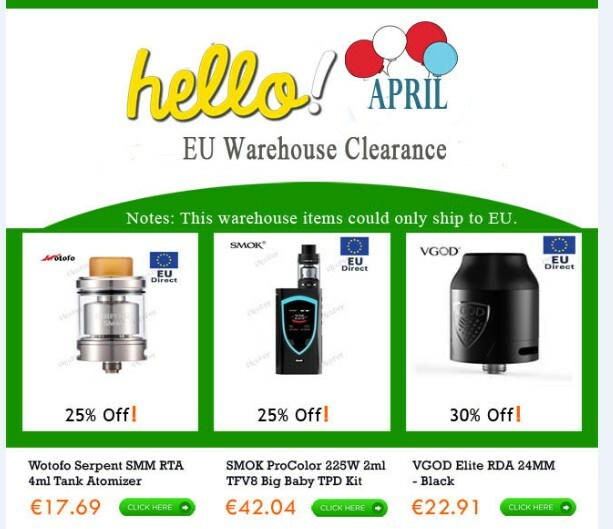 Smok TFV12 Prince Tank Black is for $20.82; etc. VOOPOO Alpha One 222W Mod, you can save $10, etc. 2018 Valentines' Day is Coming! Only $49.90 -- Geekvape GBOX Squonker Kit; etc. Valid from January 30th to February 15th. The 2018 Chinese New Year is Coming. And this letter is a notice about our Vacation begin from Feb 13th to Feb 20th. Orders and emails during this period will be processed after Feb 20th. While our EU Warehouse works normally. Thanks and wish you a Happy Chinese New Year! 7% Site-wide Coupon for you. 2018 Easter Day Big Sales Coming Now! Valid till April 4th, 2018. $22.88 for Vandy Vape Kylin Mini RTA; etc. 8% Off Coupon for New Items. And last you can also get special sales. Today we recommend following 3 items with big discount for you, which items are in our EU warehouse, and these only could ship to European countries. 1st. Wotofo Serpent SMM RTA, 25% Off! 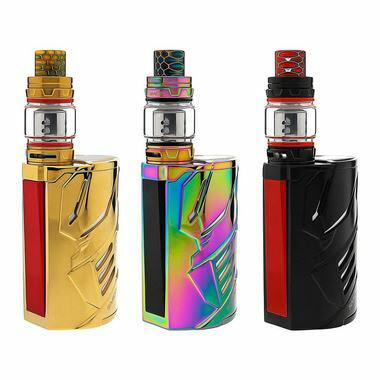 2nd, Smok Procolor 225W Kit, just for €42.04! The 3rd, VGOD Elite RDA 24MM, 30% Off!